I always have a hard time following instructions. Whether it's a sewing pattern or a recipe, I often change something in order or way of construction, or in a recipe an ingredient (usually I add spices and herbs). Now I'm doing that again on the bra I'm making. The instructions are for using fold-over elastic. I've done that before long time ago, but wasn't happy with the results, especially at the center front part, where a lot of layers of fabric and wire channelling meet. Tonight I made the cups for the bra. Construction takes a bit more time than I"m used to, as this is a new pattern with some new techniques. And then I'm changing things as well! 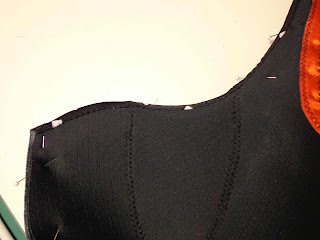 Instead of the fold-over elastic for the upper part of the cups and straps, I've cut a seam allowance to the upper parts of lycra pieces and have sewn them right side to wrong side of the foam. Then turned it over to the right side of the foam. I'm curious to know whether this will effect the fit of the cups when it's finished. Time will tell. 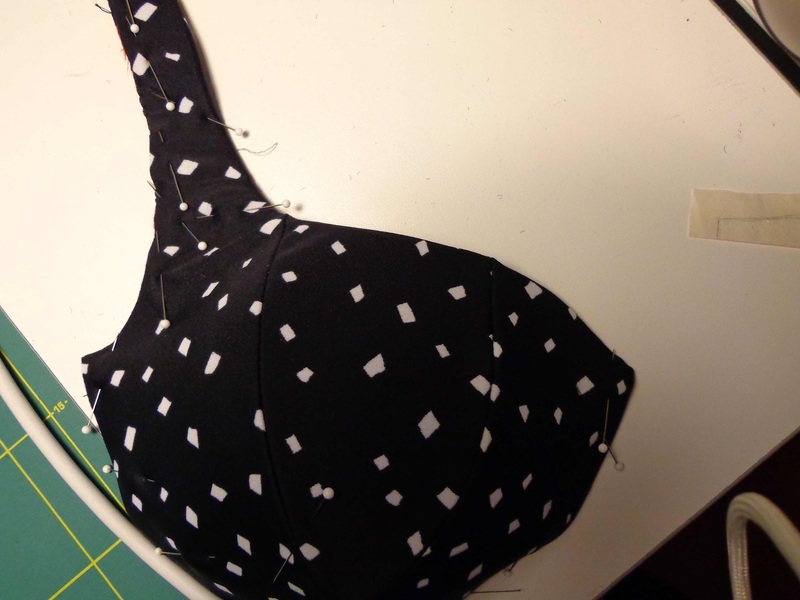 BTW: Amy from Cloth Habit is starting a bra sew along in January. If you want to try making a bra and like some guidance and inspiration, you might want to check that out. No lace this time, rather basic black and white. The outside of the cup. The inside, looks neat this way I think. It certainly does look neat this way! Ooh, is this one of the Make Bra patterns? They look like so comfy. I've tried the foldover elastic method and it was fidget-y and bulky right at the bridge, especially with foam involved. I love the the clean finish you are doing--I see that in a lot of rtw bras. I'd love to know how it fits. Thanks so much for your comment on the sew-along. You've been such an inspiration to me to make bras! I burst out laughing just reading the title to this post. I can so easily get ahead of myself and plunge right into a project, but not usually with the good results that you get. I think you made a god decsion to change the construction since it does look very neat and tidy.